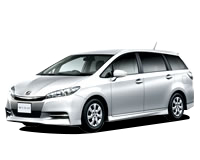 "・All cars come equipped with Non-Smoking and English voice GPS. For customers who wish to rent an ETC card_comma_ please enter "" For ETC Card Rental"" in the ""Questions"" section of the application form. From December to end-March_comma_ all 4WD cars will be fitted with studless tires. Tow Service Each incident will be reimbursed up to a limit of 150,000 Yen (tax included) of tow service. When the towing cost exceeds 150,000 Yen, the remainder cost will be borne by the customer. The tow destination will be a repair location designated by ORIX Rent a Car. *Road service is partly provided by damage insurance in cooperation with ORIX Rent a Car. When the car cannot be driven due to the accident, the rental contract is terminated.In this case, there will be no refund of the rental fee. When there is damage or problems to the car due to the accident, please stop driving immediately, and contact Tokio Marine & Nichido Fire Insurance Accident/Damage Center. In the event of accidents, theft, damage, defacing of the vehicle not caused by the rental company, and car repair or cleaning, etc. is required. During this time, the customer must pay the stated fee for incurred "Operating Reimbursement". During this time, the customer must pay the stated fee for incurred "Operating Reimbursement". *Damage to the car interior, burnt marks on the seat, loss of accessories, etc. are also included. *If the car cannot be driven, the towing fees (to designated repair shop) may have to be paid by the customer, up to a limit of 150,000 Yen. When the towing cost exceeds 150,000 Yen, the remainder cost will be borne by the customer. When you join the Rentacar Anshin Pack (RAP), Non-Operation Charge (NOC) will be waived. Also, in the event of a flat tire, tire repair or tire replacement will be free. *In the event when tire repair or tire replacement is needed, the customer may be required to pay the cost in advance. In this case, the cost will be refunded by way of receipt during the car return.